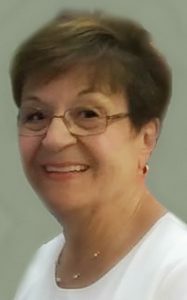 Carolyn R. (Nett) Kozachuk Agostino – of Woburn, November 14th, at the age of seventy-four. Beloved wife of the late Nicodemo “Nick” Agostino and the late Walter Kozachuk. Devoted mother of Kerri Foisy, her husband Keith of Methuen and Kristen Stevens, her husband Craig of WA. Dear sister of “Angelina” Snookie Deletter of Wilmington, Joseph Nett of Woburn and the late Tony, Domenic and Frank Nett and Mary Pedi. Loving grandmother of Ryan and Adam Stevens, and Charlotte Foisy. Also survived by her late husband Nick’s children and granddaughter. A Funeral will be held from the Lynch-Cantillon Funeral Home, 263 Main Street, Woburn on Monday, November 19th at 10 a.m. followed by a Funeral Mass in St. Charles Church, 280 Main Street, Woburn, at 11:30a.m. Calling hours will be held on Sunday, November 18th from 1 – 5 p.m. Interment in Woodbrook Cemetery, Woburn. At the family’s request, in lieu of flowers, remembrances may be made in Carolyn’s memory to the Mission of Deeds 4 Chapin Avenue, Reading, MA 01867 or to the Susan G. Komen Breast Cancer Foundation Dept. 41831, P.O. Box 650309, Dallas, TX 75265. For directions or to leave an online condolence, please visit www.lynch-cantillon.com or find us on Facebook under Lynch-Cantillon Funeral Home. Carolyn R. (Nett) Agostino passed away early today, November 14th at the Care One Nursing Center, in Wilmington. The beloved wife of the late Nick Agostino and Walter Kozachuck, she was seventy-four years of age. Carolyn was one of seven children born to the late Joseph and Frances (Coccoluto) Nett. Raised and educated here, the Nett family made their home in the Hammond Square section of the city. It was in the Hammond square section of the city, right on Main Street, where the “Donut Kitchen” owned by the Nett family, prospered for many, many decades. It was also where Carolyn and later her children, worked along side all her family members as she was growing up. From sweeping the floors to being a waitress behind the counter, they did it all! Carolyn graduated from Woburn High School in 1962. Several years later, a family member and friend set Carolyn up on a date! That’s when she met Walter Kozachuk, whom she married and spent over twenty-five years together. Sadly, Walter had passed away, but they had two beautiful daughters, who have remained lovingly attentive to their Mom. Carolyn began working in the Woburn School System, where she continued to work for 22 years, in various positions at Woburn High School, Joyce Middle School, Goodyear and Hurld Elementary. She remained in the school system until retiring in 2011. After the death of Walter, Carolyn remarried a friend they both knew, Nick Agostino. Together they journeyed for almost twenty years. They enjoyed travelling to Canada, Niagra Falls, Bermuda and visiting with their grandchildren out in the state of Washington. Dining out with her husband and family was always a treat. Every Sunday, Carolyn, Nick and her brother Joe would all go to church together. When it came to the holidays, Carolyn loved to entertain all of her family. Baking, and cooking for all with a beautifully decorated home, very tastefully done for each and every holiday. Her cooking was always Italian and out of this world! Abundant was the only word to describe all the food that was there for all to enjoy. Carolyn was very active throughout her entire life with all the different organizations she belonged too. Mission of Deeds, Sons of Italy, Elks, Meals on Wheels. And she was an intricate part of each. She had a wonderful knack of planning events, from start to finish, knowing exactly what needed to be done, and it was! Family was truly what Carolyn’s life was all about. She loved her children unconditionally and was extremely proud of all their accomplishments. The young ladies they had become and their families were all very dear to her. Life became very special for her when her grandchildren began arriving, and “Grammy” became her Monica. Sadly, Carolyn was predeceased by her parents Joe and Frances, her husbands Walter and Nick and her siblings Mary Pedi, Tony, Domenic, and Frank Nett. Carolyn is lovingly survived by her daughters and their spouses, Kristen Stevens, her husband Craig of WA and Kerri Foisy, her husband Keith of Methuen, her siblings Joe Nett of Woburn and Angelina “Snookie” DeLetter of Wilmington and her cherished grandchildren Adam and Ryan Stevens and Charolette Foisy. A Funeral will be held from the Lynch-Cantillon Funeral Home, 263 Main Street, Woburn on Monday, November 19th in St. Charles Church, 280 Main Street, Woburn, at a time to be announced. Calling hours will be held on Sunday, November 18th from 1 – 5 p.m. Interment in Woodbrook Cemetery, Woburn. At the family’s request, in lieu of flowers, remembrances may be made in Carolyn’s memory to the Mission of Deeds 4 Chapin Avenue, Reading, MA 01867 or to the Susan G. Komen Breast Cancer Foundation Dept. 41831, P.O. Box 650309, Dallas, TX 75265. For directions or to leave an online condolence, please visit www.lynch-cantillon.com or find us on Facebook under Lynch-Cantillon Funeral Home. A Funeral will be held from the Lynch-Cantillon Funeral Home, 263 Main Street, Woburn on Monday, November 19th at10 a.m. Followed by a Funeral Mass in St. Charles Church, 280 Main Street, Woburn, at 11:30. Calling hours will be held Sunday, November 18th from 1 – 5 p.m. Interment in Woodbrook Cemetery, Woburn. At the family’s request, in lieu of flowers, remembrances may be made in Carolyn’s memory to the Mission of Deeds 4 Chapin Avenue, Reading, MA 01867 or to the Susan G. Komen Breast Cancer Foundation Dept. 41831, P.O. Box 650309, Dallas, TX 75265. For directions or to leave an online condolence, please visit www.lynch-cantillon.com or find us on Facebook under Lynch-Cantillon Funeral Home. We are saddened to hear of the passing of Carolyn. Our thoughts and prayers are with all of you during this difficult time. With love and Prayers, Christina (Nett) Tilton and family. Kerri, Keith & Charlotte – I am so sorry for your loss. Thoughts and prayers go out to your entire family. Our children were students at the Hurld School, Mrs. Agostino always greeted us with a warm smile and was happy to help in any way she could. your many kindnesses and of, course, your expert bowling.